While the Healy moves along through the water and ice, it is collecting data using a number of different instruments. This team helps to keep these “underway” instruments working properly. They also help the scientists use the data. I'm on contract through LDEO to support the Healy underway science systems and assist the scientists in the use of the systems and data generated by these systems. I'm also maintaining a web-based interactive mapping server that I've developed over the last few seasons. This server allows the scientists to view the data from many of the underway systems in near real-time and is the principle interface for planning and operational decision making. 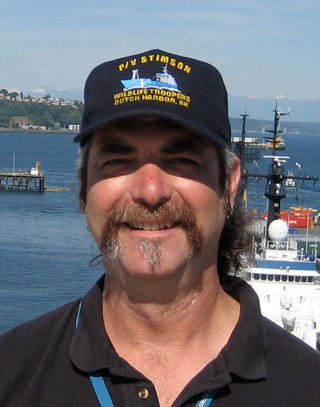 I am under contract to the USCG Electronic Support Unit in Seattle. I provide engineering, design and support services to the Coast Guard that directly support the computer, network and communications infrastructure for Healy science. I'm not a scientist so that question doesn't really fit me. I'll just say that I stood transfixed at 8 years old watching Neil Armstrong take his first steps on the moon. I was watching it on a store front TV on the streets of Bogota as I recall. Between space exploration and watching Jacques Cousteau while growing up I always wanted to explore. My life didn't really go in that direction though. I started going to sea with the US Naval Sea Cadet Corps on a naval destroyer at age 14. 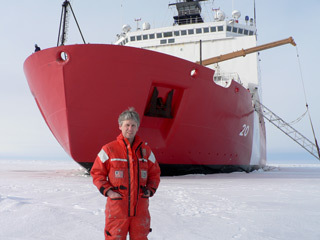 I first came to the Arctic on the Coast Guard Ice Breaker Burton Island in 1977, a year before I actually enlisted. I then spent 20 years as a telecommunications specialist in the Coast Guard and 10 years after my retirement I've spent the past five years going to sea on the Healy. I grew up in Mill Valley California. Mt Tamalpais, Muir Woods, the PacificCoast was my backyard. The Sierra mountains and Yosemite National Park weremy favorite playgrounds. After joining the Coast Guard I bounced between theSan Francisco bay area and various places in Alaska, Valdez, Juneau, Kodiakand Anchorage until taking this job and moving to Seattle in 2004. I left High School in my Junior year. I couldn't understand why I had to be in class if I could be somewhere else (say on the mountain) then read a text show up for tests and get an A. Somehow the school policies didn't coincide with my open door school schedule and neither did most of my teachers. I was thankful that I could test out of High School. I'm now trying to finish a wine production and technology program that I've been cramming into the quarters when I'm not at sea. When I no longer have the sea passing beneath my feet I'll be making wine. My role in this expedition is a support role. I help take care of problems with the data collection and acoustic systems on board. Between the multibeam sonar, both doppler current profilers, the Knudsen depth sounder and the gravimeters I've been kept busy this trip. I also have helped out on the flow through seawater system a little bit. 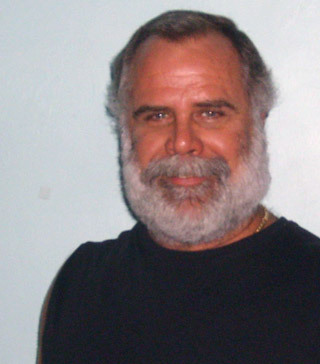 I chose electronics as a career when i joined the Air Force, and when I got out I had the opportunity to work on research ships for the University of Miami. Since I liked science so much growing up, and loved the Hurricanes football team, the challenge of going to sea and working with world famous atmospheric and oceanographic scientists, and traveling all over the world was too appealing to pass up. I was born and raised in Miami, Florida, and didn't leave until I went into the Air Force after I graduated high school. Then I traveled all over the world working on aircraft from fighter jets to spy planes. My favorite things about high school was the feeling of growing up and finally becoming an adult with enough education and knowledge to start my own life. I wanted to get out there and experience life. and wow, have I ever. My least favorite thing about high school was waking up so early, but since I've become a parent, I wake up early every morning and now enjoy the quiet time before the day starts.